Ake Rudolf. Urban Guerilla Protest. Ever since the 1999 WTO protests in Seattle, the world at large has been made aware of the grassroots, DIY approach to giving voice to opinions that have been long confined to the margins of the media. Ake Rudolf has documented the growth of this movement, focusing on the events, organizations, inventions and factions active between 1995 and 2005. In doing so, Rudolf demonstrates the verve and innovation that these urban guerillas employ, whether they are denouncing globalization or reclaiming the streets from advertisers. 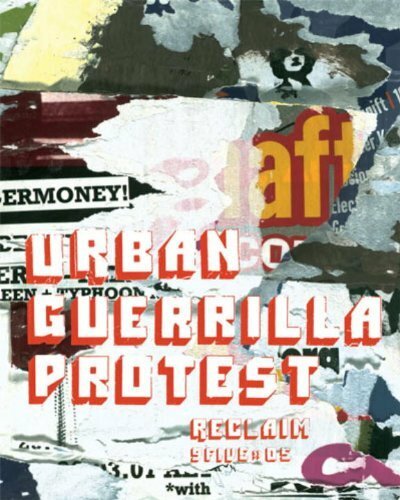 Urban Guerilla Protest features well known activists such as Reverend Billy, to lesser know, yet no less effective, protesters like the Billboard Liberation Front and Hektor, a remote-control graffiti robot. This highly visual book shows the efforts of these protestors, working all over the world, for any number of causes. Readers are left with the proof that no matter how much the world may seem hemmed in by enormous corporate conglomerates, the voices of the people will always find ways to be heard, and paid attention to. Text: Rudolf Ake. pp. 134; COL; hardcover. Publisher: Mark Batty Publisher, New York, 2008.